As I leave the house this morning, I glance at the dresser and see my camera. "I should take this today," I say to myself. "Right, when am I going to have time to take pictures of the kids at the playground when I'm most likely going to be nursing, holding the baby and feeding the kids lunch." So I leave it on the desk, safe and secure and unable to give you the evidence of today's adventure. Today Jonathan is studying for Sunday service. Every third Sunday Jonathan teaches as well as Mondays, Fridays and occasionally Wednesdays. Today was the perfect opportunity to get the kids out of the house so daddy can study in peace and quiet. Days like this usually mean an adventure, to say the least, for mommy. I leave the house, hopeful that today will go somewhat smoothly. 3 year old Josiah, 2 year old Christopher and 8 week old Ben are in the car, ready to terrorize the day. As we pull up to Carnivore, a local restaurant and playground, I grab the kid's packed lunch, pull out the stroller and pull out an anxious Josiah and Christopher and a screaming Ben. I can feel my cappuccino on the horizon, just inside Carnivore. We navigate through the parking lot as I crazily banter directions to the kids so they just get inside the doors of Carnivore safely. We get to the playground and the boys sit down for lunch at a nearby bench. Their peanut butter and jelly sandwiches resting on their foil "plates" and the boys begin to eat. I nurse the baby. "Okay, things are going smoothly, I'll just go a few feet away to tell the waiter to bring a coffee." I get up, order the coffee and I look up to see the kids have left the bench to go on the slide despite my directions to sit and eat and then play after they have finished. I give the waiter my order when I hear two screams from the playground. I look towards the slide as I see a monkey enter into the play area. I run over to the play area where two stiff-screaming boys are holding pieces of their sandwiches. One monkey, perched on top of the bench, with a mouth full of peanut butter and jelly, glares at me out of the corner of his eye, worried I will take the remaining sandwiches. I take the kids away from the monkey and carry them safely to another area. The monkey appears panicked as Josiah and Christopher scream and now, Baby Ben is crying in his blanket covered stroller. The monkey eyes the boys, then Ben, then me. The monkey seems to be surprised and worried that he caused such a commotion. 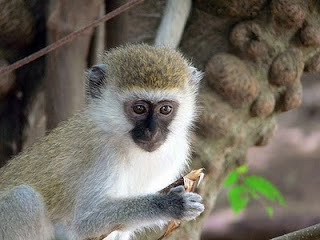 I would say the monkey looked remorseful had I not seen him eating and collecting the sandwiches frantically. The monkey's family rests on the tin roof of a nearby structure, waiting for their portion. We surrender the sandwiches gladly. Now not even ten minutes into out playtime we are on plan B. After glancing at the expensive prices on Carnivore's menu, I decided to go to the local grocery store to get something more reasonably priced. I remembered they had a small arcade inside the grocery store area and the kids could play. As I approach the waiter requesting the bill, two young Kenyan girls approach Josiah and Christopher. Now, for some reason, Kenyans seem to like to tease our children. I don't think it's because they want to see them cry, or do they? They approach our family and begin to admire Baby Ben and ask the usual question they normally ask when seeing any of our children, "Please, you will let me go home with this one." This absolutely panics Josiah and Christopher. This interrogation lasts 15 minutes until the waiter finally brings back the bill and makes change. The conversation went something like this, "Are these two twins?" (Meaning Josiah and Christopher). "No, they are 16 months apart." "And what's your little girl's name?" "Well, he's a boy, his name is Benjamin." "Please, let me take this one home," the young girl directs the question at Josiah. Josiah, "NOOO! That's my baby." "But I will take him home and he will be my baby." Panicked Josiah glares her in the eye and says, "NOOO, this is MY brother!" The relentless teasing about taking the baby home inevitably leads to teasing about taking Josiah and Christopher home. The panic increases in the boys and I think, "Why do you guys do this? Can't you see that this upsets them?" The kids are in full hysteria as I keep interjecting that they won't take anyone home. Then the girl's say, "What if I take your mommy and daddy." "Really???" I think. I calm the kids down and politely try to move things along as I assure the kids that we aren't going anywhere and neither are they. We load back into the car, off to the grocery store to continue our adventure. On the way out I notice a Kenyan man in his twenties wearing a bright tie-dyed shirt with the words on the back, "Nifty, Nifty, Someone's Turning Fifty!" Now this isn't the first time I've seen something like this. The second hand clothing stores in Kenya are where most Kenyans get their clothes. We've seen a Kenyan wearing a "Smith Family Reunion" shirt with a happy white family on the front. Or a Kenyan man wearing a Little League jacket with the team name, city and state on the front. Even shirts that have come from Disneyland or other theme parks from America. This has given me a broad sense of the "big picture" of things. Although this seems silly and even alarming to us, it's a minor thing here. They are just clothes to cover your back and keep you warm. Nothing more. Mostly we've observed that Kenyans typically dress very well. The women are usually in nice dresses, kangas or occasionally in a pants suit. Always nice shoes, a pair of high heels. Men are dressed in a pair of nice slacks and usually a button down, long sleeved shirt. Even if they are farmers, pouring concrete or doing strenuous work. On our first trip to Kenya, this had surprised me. 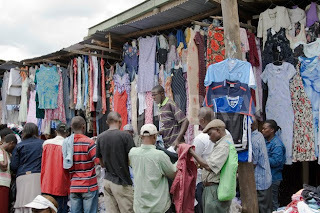 I thought that I would see more Kenyans in grungy jeans and t-shirts. I am reading a book where the author makes the point that to buy clothes such as jeans and t-shirts is a luxury, usually reserved for rich people. After chewing on this bit of information I thought, "Of course! If I made a small bit of money, I would save it to buy something that looked really nice to wear to work and to go to church in." If you came to Kenya you may observe that Kenyans dress much better than the foreigners.We observed a Maasai man today that fascinated me with his traditional wrap on the bottom half, his staff in hand and a business jacket. Truly wished I had brought my camera today. Well, as our day wound down, it ended much like it began. Removing an anxious Josiah and Christopher from the car and a screaming Benjamin. They scurried on back into the house. Another day conquered.